They’re almost ripe too. Now if I can just keep the birds away from them. 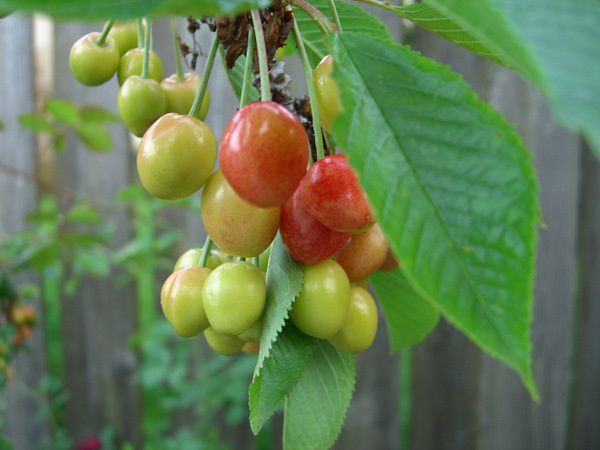 1) I see that the cherries are almost ripe, but not quite. 2) I tell myself to give them one more day and then pick them. 3) I come out the next day to pick cherries, only to find that the local birds have completely stripped the tree, leaving me with nothing but a few seeds. 4) I promise myself that next year I’m not going to wait that extra day! So… the countdown begins. I will report back on my cherry-picking luck. And this is the promise of good things to come in September. The grape vines were severely whacked back last autumn, so I didn’t think I’d have much of a harvest this year. But it looks like there will be just as many as there usually is. And that means all of my friends, my colleagues at work, and 1/2 of the neighborhood will be eating grapes until sick of them until I get sick of picking and leave the rest for the racoons until they’re all gone. I really planted the grapes in order to shade the back patio. It’s in full sun all day in the summer and really needs the shade. But I wanted a deciduous vine because there’s no sun in the winter and I need the light. 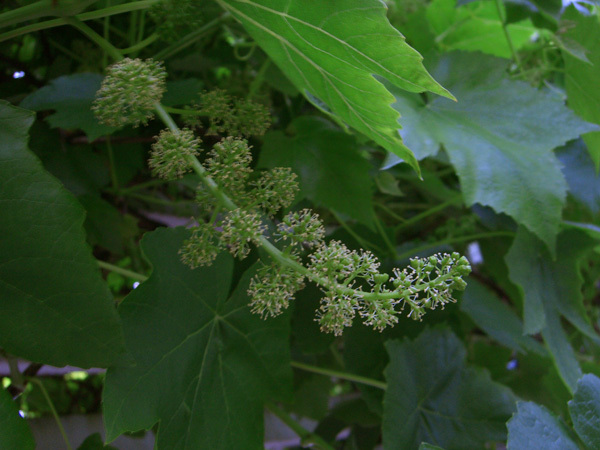 Grapes grow fast and fit the bill nicely. They covered the arbor and tried to take over the whole yard in 3 years. Now they get whacked back every year. I only have two vines. Two. They produce bushels of grapes. I prune to keep them off the roof and to prevent a stranglehold on the cherry and silk trees and to keep them in line. I do not prune for production — never even think about it. I just whack. I don’t fertilize them. Heck — I don’t even water them. Makes me wonder why grapes are seen as touchy and hard to grow. Of course, if I planted an entire vineyard my luck would probably be decidedly worse. No knitting news. I’m knitting, but nothing noteworthy right now. I frogged out the mermaid socks. I’m just not feeling the love there. I’ve strated that pattern twice with different yarns, and both times it’s gone in the frog pond. So I’m considering what to do with the rainbow yarn.